Thêm tí thông tin về chức năng theme từ tài liệu tiếng Anh (khi có thời gian mình sẽ dịch lại) hihi..
Only need to change parameters then move widgets to anywhere and to make any layout you want. 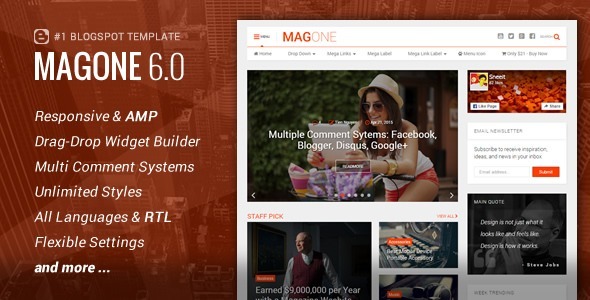 This blogger template supports drop-down, link group mega, label content mega, and icons. Passed all Google mobile friendly tests. It works well 100% with any mobile and tablet devices. Facebook, Google+, Blogger, and Disqus comment systems are all ready to work. Pick any design for label/ search/archive pages as you want with professional navigation buttons. Support Ajax content, group links, drop down, icons and open new window feature. You can configure to show the sticky menu when scrolling up or down or both. Optimize your earnings for sidebar advertisement. You can create content very quickly with a lot of ready shortcodes. Easy changing your post main title design with the default editor of Blogger. You can add subtitle of the post and pick a custom style for it. Not similar breadcrumb of other templates, our breadcrumb will show labels as exact order automatically. The template has a lot of built-in widgets: article widgets (slider, sticky, complex, carousel, one column, two columns, three columns, blogging, left and right), quote image widgets, flexible, popular widgets. You can split long post content to pages with a simple shortcode. Support most of the features from Blogger advance customizer. This template has a flexible width also. Have friendly UI for changing template options easily through SpotSettings tool. The template supports SpotLingo to translate to any languages easily and compatible with any RTL languages. Well, documentation and have many ways to support (remote desktop, log in as a member, email directly). Chức năng khóa bài viết này hay quá Ad ơi! - Step 2: You click on your social network link.